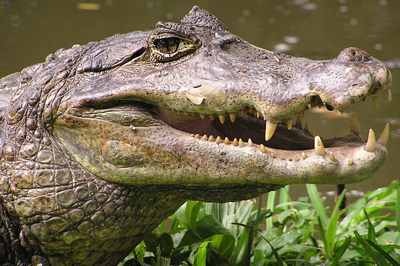 There are 23 species of crocodilians in the world. Usually, we think of these reptiles as being all the same; big head, short legs, many teeth and an eternal appetite for whatever unfortunate creature falls into their reach (humans included). 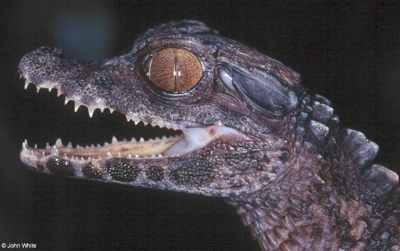 Although it is true that modern day crocodilians share a very similar basic design, each species is really unique, and has its own interesting traits. This list features the least “mainstream” crocodilians, often overshadowed by their more famous relatives, including the Nile crocodile, the Saltwater crocodile and the American alligator. Found only in certain swamps of Cuba and Isla de la Juventud, this crocodile is highly endangered nowadays. At three meters (9.84′) long, it is not particularly large for a crocodile, and it doesn’t have a very unusual appearance either, but don’t let this fool you; it is actually one of the most unique crocodilians, and according to zookeepers who have worked with them, they are also the most aggressive of them all. Due to the rarity of the species, and their extremely limited range, attacks of Cuban crocodiles on humans are uncommon and seldom reported; even so, they are very dangerous, not only because of the usual reasons (bone crushing jaws, puncturing teeth and immense strength), but also because of their unusual agility and intelligence. Keepers have reported that Cuban crocodiles can work as a team to surround and subdue large prey (humans included! ), the same way “raptor” dinosaurs are supposed to have done in prehistoric times. Although Nile crocodiles have also been reported to hunt in coordinated groups, they don’t seem to do this as often, or as skillfully, as Cuban crocodiles do. This is a very active species that spends a lot of time on land, although they are still considered to be semiaquatic animals rather than terrestrial. Found in the tropical rivers and swamps of western and central Africa, this is the smallest true crocodile species; it measures only 1.5 meters (4.92′) long (rarely 1.8 meters – 5.90′) and is a shy predator that feeds on insects, frogs, fish and whatever carrion it can find. 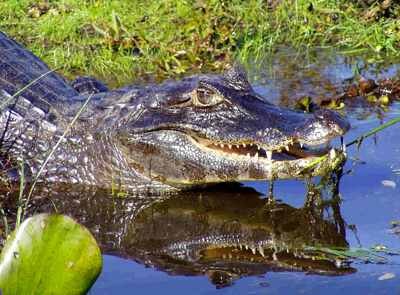 It is not dangerous to humans unless harassed (although a female protecting her nest will attack any intruders, as do almost all crocodilians). An interesting physical trait is that they are not only armored on the back, as usual in crocodilians, but also in the belly and the throat. This may be a defensive adaptation to compensate for their small size, which makes them more vulnerable to predators such as leopards. These little crocs dig burrows in the riverbank and only come out of said burrows at night; this makes them very hard to see and study, and therefore, we don’t know a lot about this interesting species. Some experts believe that there may be more than just one species of dwarf crocodile. 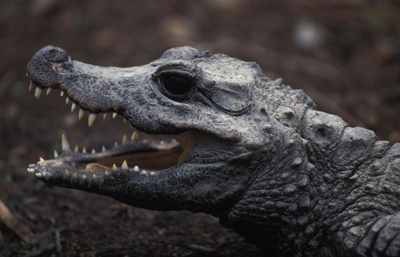 Although bush meat trade (the hunting of wild animals for their meat) and habitat destruction have caused a decline in Dwarf crocodile populations, they are not considered to be as highly endangered as other crocodilians. Another native of tropical Africa’s rain forests, the slender snouted crocodile is much bigger than the Dwarf crocodile, growing up to 4 meters (13.1′) long. 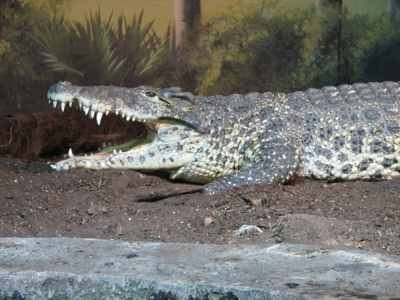 It feeds mostly on fish, but has been known to accept red meat in captivity; one kilogram of meat per day is enough to keep a slender snouted crocodile happy, and just like other crocodilians, it can go without eating for several days, or even weeks. Although not considered dangerous by scientists, the tribes of certain African regions fear these crocodiles, as they claim that they are quite aggressive. Even so, they are physically adapted to go after fish and small prey, and it is unlikely that they will attack humans unless harassed or defending their nest. The call of these crocodiles is said to resemble a truck exhaust backfiring; they also emit a chirping sound, similar to the one produced by baby crocodilians of other species. Unfortunately, this crocodile is endangered due to habitat loss and bush meat trade. Native to South Eastern Asia, particularly Malaysia and Borneo. It is seldom mentioned as one of the largest crocodilians, but there is plenty of evidence of them reaching incredible sizes, in the range of the 6 to 7 meters (19.6-22.9′). They are called false gharials because their slender snout resembles that of the actual gharial, another crocodilian found in India; however, their jaws are still broader and the largest individuals can prey on large prey, from monkeys to wild boar and deer, instead of only fish. They also feed on carrion when they get the chance. On the other hand, they only attack humans very rarely, and when this happens, it is usually to protect their nest or because they have been harassed first. 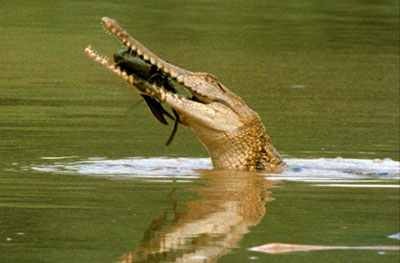 The False Gharial is endangered due to habitat loss; it is also killed sometimes out of fear and ignorance. Sometimes called the “piranha” yacare, the Yacare belongs to the group of the caimans, mostly South American relatives to the famous alligator. The piranha seems to be its favorite prey, hence its popular name. It has also been said that they are called “piranha yacare” due to the protruding teeth of its lower jaw, which resemble the piranha’s. Besides piranhas, they feed on any other fish they can catch, as well as aquatic birds, small mammals and carrion. This is one of the most abundant crocodilians in the world; there are supposedly 100,000 to 200,000 of them living in the swamps and floodplains of Brazil, Bolivia and Argentina. Fortunately, they are rather small (2 meters, rarely 2.5 (8.2′)) and they seldom if ever attack humans (although they can bite if harassed, of course). Unlike Nile or Saltwater crocodiles, which are apex predators and very rarely hunted by other animals, Yacares are preyed upon by jaguars and anacondas, and possibly even by the larger, aggressive Black Caiman. The Spectacled caiman is the only caiman that can be found in the Northern Hemisphere (its northernmost range includes the states of Chiapas and Oaxaca in Mexico), and is also the most common crocodilian in the world, with a total population of one million individuals. Spectacled caimans are unusual because they are known to change the color of their skin (although they do so rather slowly), as well as the pattern of black markings on it. As for their name, they owe it to the bony ridge between the eyes, which to some people looks as if the caiman was wearing glasses. 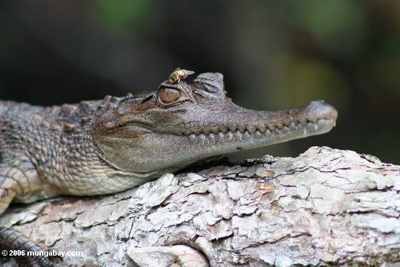 Spectacled caimans grow up to 3 meters (9.84′) long, but are usually smaller. Spectacled caimans in Mexico are seemingly smaller on average than those in South America. There are actually two species of dwarf caiman. Due to their small size (usually under 2 meters (6.56′) long), rather cute appearance (big eyes, short upturned snout and what not), and the fact that they are not endangered, Dwarf Caimans have recently became somewhat popular as exotic pets. However, they actually don’t make good pets; just like any other crocodilian, they have powerful jaws and their teeth, although small, can puncture human skin easily and cause wounds that go septic very quickly; even what may seem like a non life-threatening wound may cause an irresponsible owner to end up in the hospital. As is always the case with wild animals, Dwarf Caimans are best left in the wild. These little crocodilians are native to the Amazonian basin in South America; they feed on whatever small animal they can catch and often hunt on dry land, especially at night. Unlike crocodiles, caimans, and particularly dwarf caimans, tend to walk with their neck and head raised well above the ground. I highly recommend this website to those who may be thinking of getting a pet caiman or any other crocodilian. This little reptile is sometimes credited as being one of the inspirations for the Chinese dragon myths. (Unlike the western dragon, the Chinese version was a short legged, aquatic animal with no traces of wings). This is the only species of genus Alligator, other than the more famous American alligator. 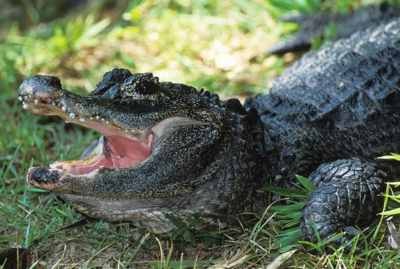 But while the latter can grow up to lengths of 5 meters (16.4′) and is aggressive and powerful enough to devour humans, the Chinese gator is a small (1.5 meters 4.92′) long), shy animal that feeds mostly on mollusks. It will also eat any fish or small animal it can catch. Unless provoked, it poses no danger to humans whatsoever. This is one of the world’s most endangered crocodilians, with as few as 200 of them living in the wild nowadays, mostly in the Yangtze river. Fortunately, they breed readily in captivity, but habitat loss and pollution may spell doom for the species in the wild in a few years. Also known as Johnston’s crocodile, the Australian freshwater crocodile is yet another crocodile with a slender snout adapted to catch fish. Although it bites people on occasion, this happens usually when the crocodile is protecting its nest or territory, or when it has been provoked; most of the time it is a very calm, harmless animal and Australians often swim in places where freshwater crocodiles (locally known as “freshies”) are known to live. Freshwater crocodiles are notorious because of their agility; they are actually capable of galloping on land like a mammal. Usually, they gallop when they feel threatened and want to return to the safety of water as soon as possible. However, they have also been known to charge at intruders in this way. Young individuals of other crocodilian species have also been known to gallop, but the freshwater crocodile are the fastest, reaching speeds of 18 kms p/h (11 m/p/h). Compare that to the average running speed of a normal, healthy man, which is of 24 kms p/h (15 m/p/h). It’s not a big difference really! And let’s consider that freshwater crocodiles have much shorter legs. These crocs can grow up to 3, sometimes 4 meters long (10-13′), but are usually smaller. Although not considered endangered, they are vulnerable to the infamous Cane Toad plague which is spreading in Australia; having evolved separated from Cane Toads, freshwater crocodiles have no natural defenses against the amphibian’s poison, and often die while trying to eat one of them. The Gharial is undoubtedly the most bizarre looking crocodilian. Its very long, very slender snout is adapted to catch fish, as are the interlocking, needle-like teeth. Gharials are possibly the most aquatic of all crocodilians, and they have very short and weak legs; they actually only leave water to bask in the sun and to lay their eggs. This crocodilian is found in India and Nepal, and is among the largest members of the group, reaching 7 meters (23′) in length. Despite their huge size, they are usually harmless to humans; however, they can bite in self defense if provoked. Gharials get their name from the protuberance in the adult male’s snout, which is called a ghara. Gharials use the ghara to produce a sound which is supposed to attract potential mates. It seems that males also use their ghara to produce bubbles with the same purpose. Some prehistoric crocodilians such as the enormous, dinosaur-eating Sarcosuchus also had a ghara. Who knows what amazing sounds they may have produced! 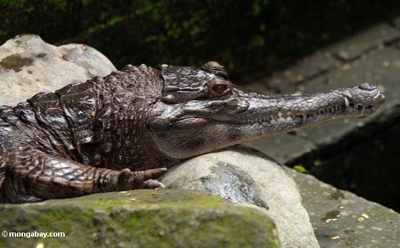 Gharials are, themselves, the last survivors (along with false gharials) of a crocodilian group that was once widely distributed and diverse; remains of gharials and gharial-like crocodilians have been found even in South America! 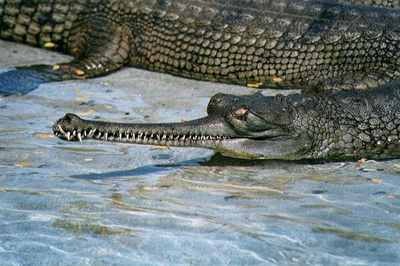 Unfortunately, the survival of the Gharial is, as usual, threatened by the advance of “civilization” and the loss of habitat. There are around 1500 gharials living in the wild nowadays, and the population seems to be declining due to water pollution with heavy metals.